How do we make sense of the times we’re living in? Poet and experimental filmmaker James Broughton tried to give an answer to that eternal question with this poem, which he recommended to journalists. We had such a great conversation on Voice of Vashon — as part of Prose, Poetry and Purpose’s 2016 focus on the Political (R)Evolution — that we decided to go deeper into our exploration of both journalism and James Broughton. In particular, March wanted to explore Stephen’s non-profit, Journalism That Matters (JTM); a think-tank on the future of journalism which Stephen and colleagues created in 2001. In short, JTM seeks to foster collaboration, innovation, and co-creative action amongst journalists. The goal? Words and images used wisely to birth a news-ecosystem that builds diversity awareness in a way that allows communities to truly thrive. Well, yes and no. There is always that divide between ideals and reality. In fact, many people rate journalism nearly as low as Congress on their trust rankings (yeah – it’s pretty bad). Which makes sense. As happens with all positions of power, modern journalism (like politics) is struggling greatly to maintain its honor. However, as JTM illustrates: ethical journalists are working collaboratively to reclaim their vital purpose as information-bearers in service to their readers and viewers. Naturally, the plight of American journalists is not a solitary problem. Most systems in our country face severe challenges. When you compare America to most other advanced nations in the world, we fail miserably on important issues such as: health care, education, environmental ethics, politics, and public safety. Which is why JTM is so important! To improve our nation, we must first see it clearly for what it is. Its strengths, weaknesses and potential solutions. What might some of these solutions be, within the realm of journalism? For one thing, we’d like to see less lecture and more conversation. How do you feel when you read an article that tells you what to think? How might an article, instead, be written so that its readers become informed, curious, aware and motivated to get further involved? To achieve this goal, an article would need to be free from the monied interests of the corporate class. As in, journalism of the people, by the people and for the people. Thanks to the internet, we are in fact seeing an explosion in “citizen journalists,” and while some things may occasionally suffer (like grammar or a lack of fact-checking) there is still great benefit. Especially given that professional journalists tend to refer to themselves as cynics. Consider what happens when our storytellers view the world through a lens of winners and losers, black and white, or even Republican and Democrat? Our culture is quite more creative and complex than that, as James Broughton’s story in the film ‘Big Joy’ illustrates. James Broughton lived at a time when truths were hidden and lies were preferred. Yet, he was an explorer and purveyor of untouchable truths. As such, upon receiving a prestigious and rare award at the Cannes Film Festival in 1954, he refused an offer to direct Hollywood films. 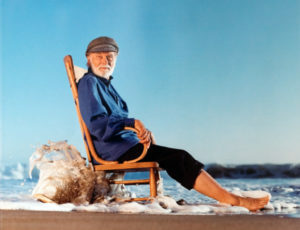 “I’m a poet, I didn’t want to go into business,” he explained, as he chose the artistic freedom of self-employment. Unlike James, many journalists, once regularly employed, find themselves forced by editors (and advertisers) to seek out sound bites that fit a pre-ordained story. Just as Americans are fighting to get Big Money out of Politics…so must we sever Big Money’s “thought control” role in the realm of journalism. What if journalists sought to improve the world, one reader at a time, instead of viewing the audience as passive consumers? What if a story was deemed worthy because the community it was about also supplied the majority of the narrative? What if journalists spent more time listening, free from preconceptions, so that when they did set pen to paper, they had something truly new to report? We sit on the edge between a brave new world of positive communication and public participation OR a 1984-style rat race of cynicism and self-focus where each person finds herself with less and less chance for economic and creative opportunity. And while we cannot claim to have an answer, we are pretty sure there is one. It lies there, within each of us, waiting to be found and shared; if we can but quiet our expectations long enough to hear our own voice. 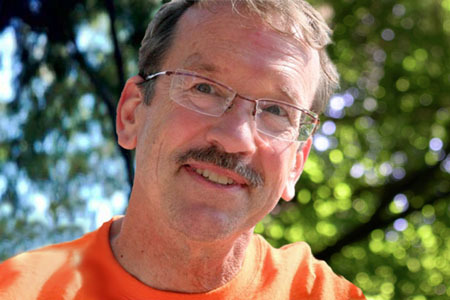 Don’t miss Stephen Silha’s interview on Prose, Poetry & Purpose, where we talk about James Broughton and his vision of a world where people “follow their own Weird.” Part an experience of ecstasy…part an unveiling of all that the Earth can offer us; his work both required and fostered an open heart and mind. And now, in celebration of the beauty within each of us, we leave you with a sweetly succinct poem by James Broughton. 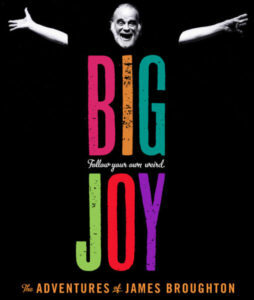 Look for Big Joy online, on DVD, or on public television! Details at http://www.bigjoy.org. DVDs are also currently available at Vashon Book Shop. PreviousGot a Smartphone? Post a Video to Get Out the WA State Primary Vote!